What is it about? 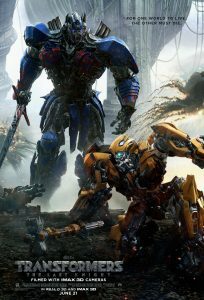 In the fifth movie in the Transformers series, Humans and Transformers are at war. Optimus Prime, the leader of the Autobots (“good” Transformers) is gone. Meanwhile, Cade Yeager (Mark Wahlberg), who assisted the Autobots fight the Decepticons (“bad” Transformers) in the last movie is a fugitive. And that’s about all you need to know going into this movie. How is it? 2.5/10 Transformers: The Last Knight is a cluttered, lazily written 2 1/2 hour mess of a movie with few redeeming qualities. The Ups Despite the awful script he had to work with, Anthony Hopkins, who plays a man named Edmund Burton tasked with delivering exposition, has fun with the role. As he spouts ridiculous dialogue, he proves entertaining when the movie itself can’t. 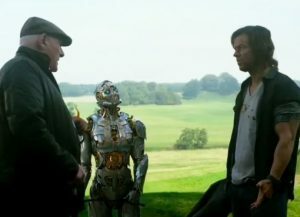 His Transformer assistant Cogman (voiced by Jim Carter), who is like an aggressive C-3PO, delivers some fun dialogue and has a few mildly enjoyable scenes. Say what you will about the quality of this film, but the visuals are stunning. All the CGI is executed quite well and there are some gorgeous shots Michael Bay includes here. Additionally, a few action sequences, although cluttered, are entertaining- Michael Bay knows his way around these sequences. The Downs First off, the script here is terrible. It’s chock-full of awkward, cheesy dialogue that detracts from the movie, not to mention the almost cringe-worthy jokes here that none of the audience laughs at. The plot of The Last Knight is comprised of subplot after subplot, and many of these go nowhere and overcomplicate everything. There is so much not paid off in this movie, as it just throws everything out there, expecting it will work. This movie is cluttered, to say the least. It is lacks any coherence whatsoever, given that everything is happening at once and you, as the viewer, aren’t interested in any one subplot. Not only is the story cluttered, but the cast of characters is too. There are just too many characters, and very few serve a real purpose. A prime example of this is the 14-year-old girl named Izabella (Isabela Moner) introduced at the beginning of the movie. She shows up at the beginning, does nothing useful the whole movie, and pops back up at the end. Transformers: The Last Knight is an utterly brainless, confusing clump of story. It’s quite forgettable as well, as it’s basically made up of generic subplots stacked on top of each other, intertwined with giant explosions. This movie is exhausting to keep up with: I, myself, lost track of the plot around the end of the second act. The movie moves from dumb sequence to dumber sequence with an either exhausting side story in the middle or groan-worthy dialogue. Did I mention that this movie is 2 1/2 hours? Compared to other Transformers movies, that’s half an hour shorter, but it still feels 3 hours. Everything feels dragged out. Don’t expect Optimus Prime a ton either; he’s on all the trailers and posters, but is barely in the movie until the end. The last act of Transformers: The Last Knight is just a mess. It’s just a bunch of Michael Bay explosions and action, but there’s so much going on at the same time that it becomes a nonsensical mush of action. 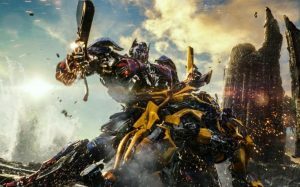 Although not as much as previous Michael Bay movies, Transformers 5 somewhat shamelessly objectifies women, and racial stereotypes are sometimes played up. The product placement here is quite blatant and obvious. One thing that bugged me constantly throughout this movie was the changing of aspect ratios. Aspect ratios are whether or not the black bar on the top of the screen is present, and because Michael Bay shot this with different cameras, they constantly change. He shot partly in IMAX, which is extremely nice to look at when it fills up the screen, but he constantly changes to digital camera, which means that there’s a small black box popping up and down. And he doesn’t only change when an action sequence is over: he often does it within a scene, after a few shots, which isn’t only distracting and irritating, but also jarring. Besides this, some of the editing at times is very choppy and sometimes just strange. The Last Knight is lazily written, edited, and acted, but it will still probably rake in a ton of money at the box office. 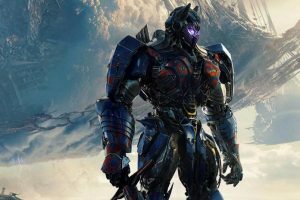 Overall, Transformers: The Last Knight is a horrible movie. The dialogue is awkward, the plot is overstuffed with subplot after subplot, and the aspect ratio changing is annoying. It is a brainless, nonsensical blob, albeit boasting stunning visuals and cluttered, but entertaining action sequences.